GRIDFORM™ is a prefabricated fiber reinforced polymer (FRP) double-layer grating, concrete-reinforcing system with integral stay-in-place (SIP) form for vehicular bridge decks. The GRIDFORM™ Design Guide is provided as a service to structural engineers to determine if GRIDFORM™ can be used as an alternative to steel rebar as the internal reinforcement system for reinforced concrete bridge decks. The use of GRIDFORM™ by an engineering firm or installation contractor is governed by Strongwell's Terms and Conditions. Please review these terms and conditions prior to using the GRIDFORM™ Design Guide. The GRIDFORM™ Design Guide requires Microsoft® Excel® version 2003 or 2007. SAFSTRIP® is a pultruded composite strip that improves the strength of an existing structural member when mechanically fastened to the structure. The reinforcing strip has high bearing and longitudinal properties and is designed to strengthen the flexural capacity on the tension face of concrete girders, slabs and decks. 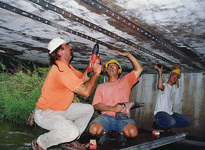 Installation on bridges can occur without any interruption of service. Low-Cost Rehabilitation with FRP Strips written by MARK D. WHITTEMORE, P.E., and ROBERT H. DURFEE, P.E., SECB DuBois & King, Inc., Bedford, New Hampshire as presented at the 2011 International Bridge Conference. 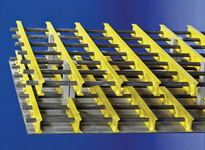 SAFSTRIP® is supplied in rolls and may be pre-drilled with holes at the required fastener spacing to receive fasteners. 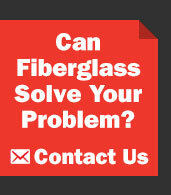 SAFSTRIP® measures 4" wide x 1/8" thick and is shipped in rolls up to 100 ft. long. SAFSTRIP® is designed to be easily field cut by the customer into shorter lengths using standard carpenter tools. The SAFSTRIP® design software is provided as a service to structural engineers to determine if SAFSTRIP® is a product that can be used to economically rehabilitate deteriorated concrete structures. The use of SAFSTRIP® by an engineering firm or installation contractor is governed by Strongwell's Terms and Conditions. Please review these terms and conditions prior to using the SAFSTRIP® design software. SAFSTRIP® design software requires Microsoft® Excel® version 2003 or 2007.